The euro notched up its highest level in six months after centrist reformer Emmanuel Macron won the French presidential election on Sunday, neutralizing the biggest political challenge to the currency in its 18-year history. His far right opponent, Marine Le Pen, had threatened to scrap the euro and reintroduce France’s old money — the franc. Losing its second biggest economy could have spelled the end of the euro. The euro edged up 0.2% to above $1.10 in early Asia trading, its highest level since November. It slipped back a little in European trade on Monday. Most big Asian stock markets posted gains, but European indexes were mixed. Investors had plenty of time to prepare for a Macron win. The political novice, who won about 66% of the vote, had established a clear lead over Le Pen in opinion polls since winning the first round of voting on April 23. The euro, European stocks, and government bonds all moved higher last week in anticipation of a Macron victory, and that helped explain the muted reaction to Sunday’s vote. Just six months ago there was talk of the euro hitting parity with the dollar. That trend has been reversed. 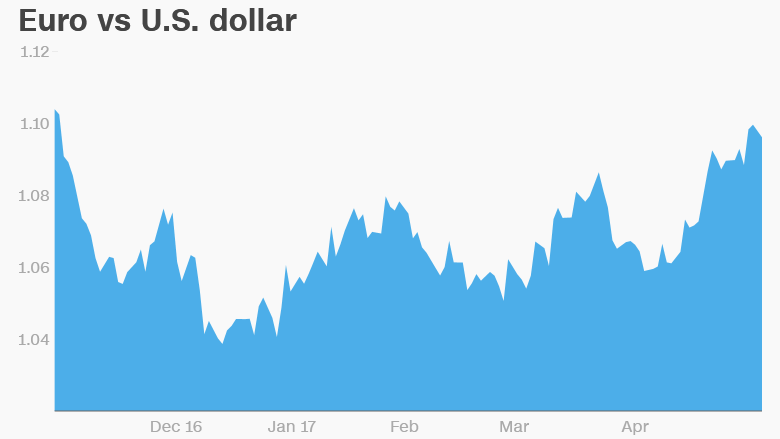 “The euro has gained almost 4% versus the U.S. dollar over the past month, and we expect the single currency to extend its gains over coming months,” said Mark Haefele, chief investment officer at UBS Wealth Management. Investors will be hoping Macron’s planned reforms will stimulate growth and employment in France, which has in recent years lagged behind Germany and the U.K.